EasyDNNmobileRedirect is a module that redirects mobile users to the desired site, typically a site adapted to mobile devices. The module needs to be placed on the page from where you want to redirect visitors with mobile devices (usually a homepage), and then specify a URL where mobile users will be redirected. The module detects mobile devices and redirects them to the specified URL. The module can detect the iPhone, ipad, BlackBerry, Windows Mobile, Android and SymbianOS, Samsunga Bada and Windows Phone 7, and redirect each of these devices to the specified URL. Added option where mobile users aren’t redirected automatically. You can place a link on your website which will lead to mobile version. 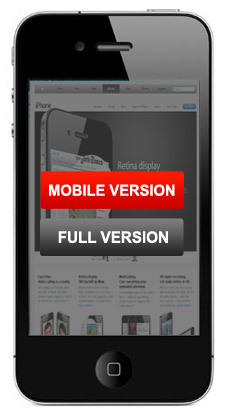 Added option to display selection to mobile users where they can select to between mobile and full version. Added new option to pass query strings to redirected page. Improved display of site version selection - Improved display of site overlay that prompts user to select mobile or full site version.